Prominent & Leading Manufacturer from Pune, we offer tensile testing machine for construction. We have been ranked as the most dependable and leading firm all over the nation and actively emerged in providing Tensile Testing Machine for Construction. The offered tensile testing machines are manufactured by using best quality materials under the observation of skilled professionals. Offered tensile testing machines are accessible in numerous specifications according to the requirements of customers. Our tensile testing machines are tested by quality controllers on different parameters to make certain that we are delivering only flawless range to the clients as well. 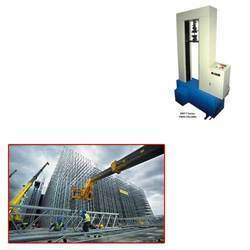 Looking for Tensile Testing Machine for Construction ?